Working in an office is not for everyone. Maybe the nine-to-five grind gets you down, or maybe office politics are not your thing. Whatever the reason, there’s no need to resign yourself to spending your entire working life feeling like you’re writing with your non-dominant hand. There are plenty of non-office jobs out there that play to the strengths of the worker who’d rather telecommute, work outside, or spend their workdays on the road. Something here is bound to be right for you. As healthcare providers look to cut costs, and patients grow used to being able to do everything from the comfort of their own home, telemedicine will likely experience a boom. For doctors who need a break from commuting to the office or hospital — or who live in places like Alaska, where said commute might involve small aircraft — telemedicine holds promise. How to Become a Telemedicine Physician: Like all doctors, telemedicine physicians need a medical degree and licensure to practice. They must also be personable and comfortable with technology, in particular, video conferencing software. Although not as fast-growing as some occupations on this list, an airline pilot is an awesome job that won’t require you to spend any time in an office environment. Of course, it’s not for everyone — if you’re not good under pressure, or able or willing to put in the time to become a skilled and reliable pilot, this won’t be the right job for you. How to Become an Airline Pilot: At a minimum, commercial pilots need a high school diploma and a commercial pilot’s license. Airline pilots typically have a bachelor’s degree and an ATP certificate from the FAA. If you’re detail-oriented and mechanically inclined, a career as an elevator installer/repairer might be the right fit. People in this job spend their days repairing elevators, moving sidewalks, and escalators. How to Become an Elevator Installer/Repairer: This job requires a high school diploma and an apprenticeship, with high school classes in math and mechanical drawing being useful for students who want to compete for slots in apprenticeship programs. Additionally, 35 states require workers to be licensed. Registered nurses who want to work from home can easily find jobs working as nurse case managers for hospitals, healthcare providers, or insurance companies. Nurse case managers help determine appropriate treatment plans for patients. How to Become a Nurse Case Manager: Clinical experience is required for this role, as well as an associate’s or bachelor’s degree in nursing. Nurse case managers should also be comfortable with technology. One in seven web developers is self-employed, according to the most recent data from the Bureau of Labor Statistics, which means that one in seven web developers can definitely skip the whole office experience and work from home. Many employers also allow their web developer employees to telecommute on a full- or part-time basis. This career is a good fit for creative, detail-oriented, tech-savvy folks. How to Become a Web Developer: Typical entry-level education is an associate’s degree, although some employers may prefer a bachelor’s. If you don’t mind heights of up to 260 feet above ground and want to be at the forefront of the green energy movement, this job might be perfect for you. Instead of spending your days slaving away under fluorescent lights, you’ll repair and install wind turbines in the great outdoors. 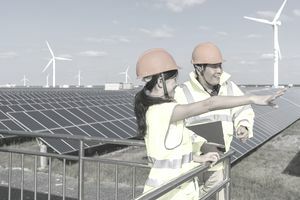 How to Become a Wind Turbine Technician: The typical entry-level education for this role is some college, no degree, per the Bureau of Labor Statistics. Most attend a technical school and receive on-the-job training from their employers. If you want a career in which you truly make a difference in people’s lives, being an EMT or paramedic might be for you. People in these jobs respond to medical emergencies, offering life-saving care. A cool head under pressure is a must in these jobs. How to Become an EMT/Paramedic: EMTs and paramedics must be licensed and attend a postsecondary training program. Another job for someone who isn’t afraid of heights, line installer/repairers maintain power and telecommunications lines. They’re the folks you see climbing up telephone poles when wires are down or service expands. How to Become a Line Installer/Repairer: Most people in this job receive long-term on-the-job training, and many attend apprenticeship programs. If you’re a computer-savvy person and a good communicator, computer support specialist is a great work-from-home job. While not every employer allows telecommuting, this role is so technology-dependent, there’s really no need for companies to spend cash on real estate. How to Become a Computer Support Specialist: Some employers prefer a bachelor’s degree, but the most important qualification for this job is simply to know what you’re doing. An associate’s degree or even a few additional classes in addition to a high school diploma might be enough. Probably the job pictured first when people say “work-from-home job,” customer service representative has a lot of pros to recommend it. It doesn’t require a lot of education and training, and as mentioned, often allows telecommuting. While dealing with the public might be a bit of a grind in the long-term, this role could be the perfect short-term gig for the right person. How to Become a Customer Service Representative: On-the-job training and a high school diploma will get you started in this role.